Mitt Romney made a joke about the so-called "birther" conspiracies that question whether President Barack Obama is an American citizen, telling a crowd in his home state of Michigan that no one has ever questioned his birthplace. "No one has ever asked to see my birth certificate," Romney said at a rally in Commerce, Mich., as he campaigned alongside his running mate, Rep. Paul Ryan. Referring to his wife, Ann, who is also a Michigan native, Romney said, "They know that this is the place that we were born and raised." In a subsequent interview with CBS News's Scott Pelley, Romney denied he was taking a "swipe" at Obama, insisting he was only making reference to the fact he was campaigning in his home state. "I've said throughout the campaign, and before, there's no question about where he was born. 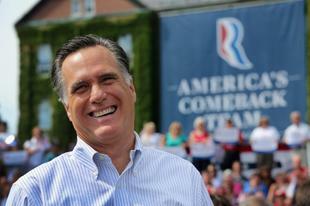 He was born in the U.S.," Romney told CBS. "This was fun about us and coming home and humor. You know, we've got to have a little humor in a campaign, as well." Indeed, Romney has long declined to become involved in conspiracies about Obama's birthplace, calling the debate a distraction from real issues. But he hasn't exactly condemned supporters who have continued to question whether Obama is really an American citizen. That list includes Donald Trump, a high profile Romney supporter who has helped raise cash for the presumptive Republican nominee. Asked in May if he is "comfortable" with Trump's suggestions that Obama wasn't born in the United States, Romney got a bit irritated. "You know, I don't agree with all the people who support me, and my guess is that they don't all agree with everything I believe in," Romney told reporters on his campaign plane. "But I need to get to 50.1 percent or more, and I'm appreciative to have the help of a lot of good people." The Obama campaign quickly pounced on Romney's remark, accusing him of siding with extremists in his party. "Throughout this campaign, Gov. Romney has embraced the most strident voices in his party instead of standing up to them," Obama campaign spokesman Ben LaBolt said in an email to reporters. "Romney's decision to directly enlist himself in the birther movement should give pause to any rational voter across America." Romney's comment technically wasn't true. As Politico's Maggie Haberman quickly noted on Twitter, reporters asked to see copies of Romney's birth certificate during the 2008 campaign—not to see his birthplace but rather to verify his full name.